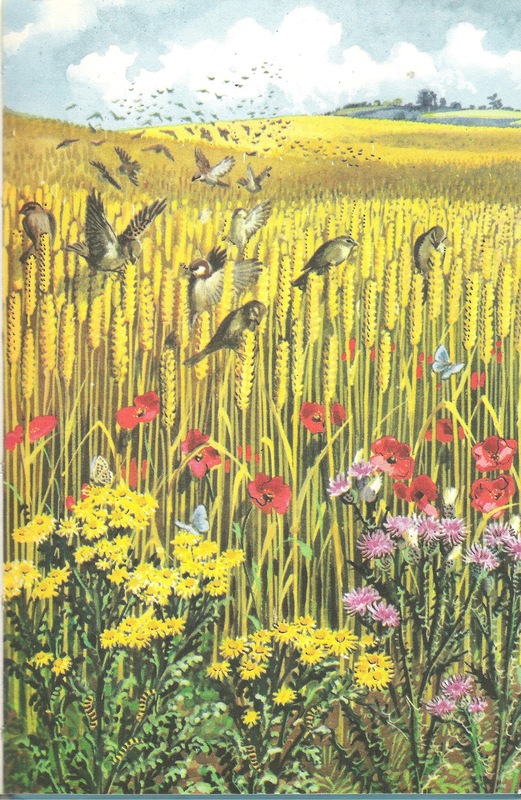 This is a really lovely image, bursting with life and colour. A big flock of house sparrows is raiding the seeds from ripe wheat. Around the margins of the wheat field, the yellow ragwort and creeping thistle are growing interspersed with red poppies. On the ragwort are feeding the black and yellow striped caterpillars of the cinnabar moth, and common blue butterflies flutter from flower to flower. As we’ve looked at the decline (and possible subsequent rise) of the house sparrow in an earlier Spring post, here, this post will focus more on the flowers of agricultural land and field margins, and their associated insects. The red flowering Common poppy (Latin name: Papaver rhoeas) is, according to Richard Mabey’s Flora Britannica, one of the world’s most successful “weeds” and has “followed and exploited the spread of farming across the globe so comprehensively that no one is sure of its native home.” An annual plant, it is found in arable fields and on other disturbed habitats. And it is that habitat preference that meant that, as the first early city-based societies formed 4-5000 years ago in the Middle East around a growing culture driven by arable agriculture, the common poppy was there and ready to benefit from this massive and relatively rapid increase in the area of its habitat. And just thinking about the importance of natural processes influencing culture, it is that habitat preference of growing in disturbed soils that led to the iconic image of the red poppy as a commemorative symbol for the dead of two World wars and other conflicts. The hellhole trench warfare battlefields of World War One in northern France and Belgium, with their shell-torn and trench-riven land surface, created huge areas of disturbed soils that were colonized by millions and millions of red poppies, leading to the adoption of the red poppy as the ultimate symbol of commemoration. Richard Mabey suggests that the first common poppies probably arrived in Britain mixed in with the seed corn of the first Neolithic settlers. The New Atlas of the British and Irish flora suggests that “although there have been losses around the edges of its range, the overall distribution is remarkably stable”. This is strange, as I think the common perception amongst conservationists is probably that a major effect of the increase in the use of herbicides to control agricultural “weeds” from the 1960’s onwards was a decline in the fortunes of plant species like the common poppy. From the early 1970’s, I do have vivid memories of seeing cereal fields in East Lothian in early summer with a red dusting of poppies scattered through them, something that 10-15 years later was not a common sight. But the range could be the same with many fewer poppies as a whole, if the species remained in field margins and on other, non-agricultural, disturbed ground and also, the policy of set-aside no doubt helped the return of poppies to recolonise agricultural areas from the late 1980s onwards. A very welcome return, I say! The Creeping thistle (Cirsium arvense) in the picture is usually found (according to the New Atlas) in “over-grazed pastures, hay meadows and rough grassy places, roadsides, arable fields and other cultivated land, and in urban habitats and waste ground.” In terms of its status, although listed as a noxious weed in Britain under the 1959 Weeds Act, there has been no change in distribution since the 1962 Atlas and probably little over many decades before that. The Common Ragwort (Senecio jacobaea) is species that raises high emotions in this country! As Richard Mabey says in his For a Britannica: “Ragwort is regarded as the great enemy by those who keep horses, and summer weekends spent laboriously hand-pulling and removing the plants are a regular chore to check the plant’s spread. Neither horses nor other grazing animals will normally eat the growing plant, unless it is so dense that it is difficult to graze without ingesting some, but they will when it has died and dried. Green or dry, it causes insidious and irreversible cirrhosis of the liver.” Nice! According to the New Atlas: “It is a notifiable weed, subject to statutory control, but this has clearly had little, if any, effect on its distribution or abundance.” In fact: “The distribution of S. jacobaea is unchanged from the map in the 1962 Atlas.” Interestingly, for such a supposedly noxious plant (here in Stirling, apparently, it is or was called stinking alisander), Tess Darwin, in her “Scots Herbal”, reports that, not only was it uprooted and used in a playground chasing game in the Hebrides, but it has traditionally been used for a range of medical purposes. The astringent juice was used “to treat burns, eye inflammation, sores and cancerous ulcers, as a gargle for an ulcerated throat and mouth and for bee stings.” Poultices were also made from the green leaves and applied for rheumatism, sciatica and gout, while “a decoction of the root was taken for internal bruising and wounds”. Drawing your attention back to “insidious and irreversible cirrhosis of the liver”, I say rather them than me... Common ragwort was also used to produce bronze, yellow and green dyes. I don’t think it wouldn’t be right to talk about the Common Ragwort without also discussing the Cinnabar moth (Tyria jacobaeae), something that was obviously also on the mind of Charles Tunnicliffe, who included the orange and black striped caterpillars of the moth in the painting, doing what they normally do, feeding on the leaves of the common ragwort. Even the second part of Latin name of the moth (“jacobaeae”) tells us that the moth is “of” the ragwort! As reported by Butterfly Conservation’s report, “State of Britain’s Larger Moths”, the Cinnabar is one of the most familiar larger moths “on account of its attractive black and red wings and because of its distinctive orange and black banded caterpillars found on ragwort.” This moth species is widespread and common in southern Britain, but its distribution in Scotland is more local and coastal. Butterfly Conservation does report, however, that its populations have suffered a long-term decrease of 83% over 35 years, marking the species as “Vulnerable” according to the conservation criteria of the World Conservation Union (IUCN). It isn’t clear why this is happening, since the overall distribution of ragwort, its host plant, remains relatively unchanged, as reported above. Both the adult moth and the caterpillars taste bitter to birds that eat them, and the coloration (the bright red on adults, and the black and orange stripes – a common warning coloration in nature!) may be intended to deter predation. This species is the first one for which I understood that there could be plant-insect interactions that meant that some insects were dependent on specific species of plant. When, as a young boy, I used to accompany my Dad when he was out patrolling as a countryside ranger, we would see ragwort plants growing in the dune grasslands (for example, at Yellowcraig, near North Berwick), covered in cinnabar caterpillars (which we never saw anywhere else, on any other plant). By the end of the Summer, a large proportion of the ragwort plants were (and still are) stripped down by the caterpillars to bare, leafless, flowerless stalks. On those childhood trips where I began to learn through observation about the natural history of dune grasslands we would usually see numerous Common blue butterflies (Polyommatus icarus), perhaps not surprisingly, as it is one of Britain’s commonest species. Its caterpillars feed on bird’s foot trefoil, clover and related species. Butterfly Conservation has reported, in its State of Butterflies in Britain and Ireland, that, despite some evidence of decline at a local scale, nearly all the places where it was recorded in the 1970’s, still had records between 1995 and 2004. Butterfly Conservation does highlight, however, that the Common Blue continues to face threats from habitat loss and deterioration and that its status should be closely monitored as an indicator of the state of biodiversity in the wider countryside. I hope you’ve enjoyed this particular post – this current picture of a field of grain near harvest is, in my view, a joy to look at, and it represents the last clearly summery picture in the Ladybird Summer book. The three final images from the Summer book look increasingly Autumnal, as you will see over the next few days.